The Reading List | A Continuous Lean. We spend more and more of our time looking at screens–you’re reading this on one. That’s the way of the world, but there’s still something to be said for print (at least among those of us with graying beards). In that spirit, here are some favorite books of the season. They include beloved subjects: photography, the media, travel, and, of course, drinking. There should be something here for you and anybody you like to raise a glass with. You need another book on drinking like you need another blue blazer–but when well-executed they’re both indispensable and beloved. Jim Meehan, everybody’s favorite bartender, has produced a book that’s both highly learned and incredibly practical. Crucially it wears its knowledge lightly, so you’ll discover all you want to know about the history of genever and then what to do with it in real life. Wide-ranging and engrossing, Meehan’s Bartender’s Manual features expert interviews, useful recipes and obscure histories. It rightly belongs on the shelf next to The Gentleman’s Companion Exotic Drinking Book and Kingsley Amis’s Everyday Drinking (which remains one of the indispensable books ever printed). A fascinating look at the history of the magazine that helped define–and market–rock and roll. Wenner comes across as ambitious, visionary and astonishingly vain. Hagan brilliantly paints a biting portrait of one of America’s compelling and divisive media figures. With engrossing stories of Hunter Thompson’s frenzied habits, Annie Lebowitz’s remarkable and reckless early career, intra-Beatle intrigue and the shameless Rock and Roll Hall of Fame, which Wenner ran like the bouncer to his own private club. Sticky Fingers dives headlong into 1970s New York, detailing drug use and sexual adventurism on a massive scale. Crucially, it’s a profile of the dawn of celebrity culture, which still infests the country to this day. Salter, who died in 2015 at aged 90, was the celebrated and highly polished author of novels including A Sport and a Pastime and Light Years. But his sensational memoir, Burning The Days, and hard to find travel writing (collected in There and Then) are some of the most rewarding aspects of his work. Here, journalistic pieces draw from his core interests, including screenwriting, mountain climbing, living in France, the early days of Aspen, where he moved at the right time (the 1960s, when a house cost less than $30,000). This is a man who valued enduring ways and customs, and the stories that continue to be told after we’re gone. Salter lived the life he wanted: a successful fighter pilot in Korea, later he became friends with the young Redford, skied the Alps with Austrian champions, dined late at La Coupole, committed adultery without apology. A military man, he had what now seems like an old-fashioned fascination with honor. But reading his works he feels the opposite of outdated–many of his words, as he intended, remain timeless. 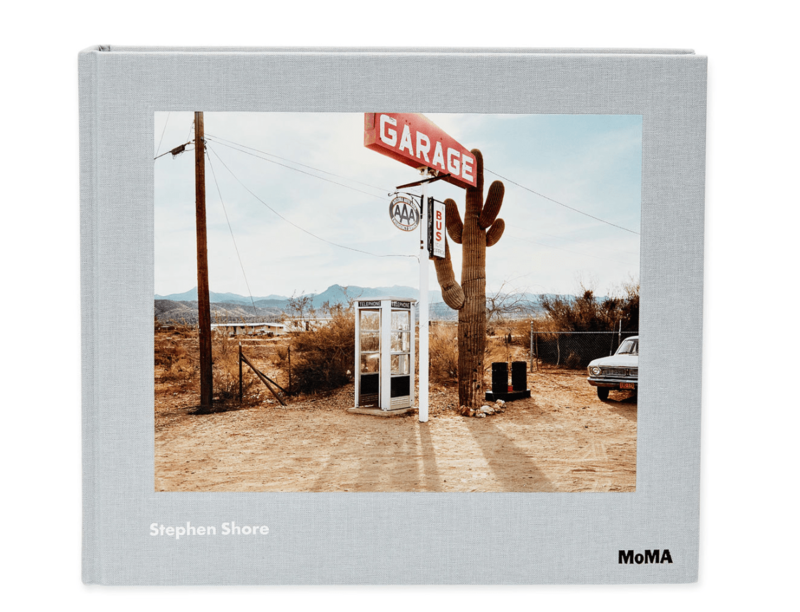 Shore, one of the great photographers, currently has a wonderful retrospective on view at MoMA. Peter Scheldahl, art critic of The New Yorker called him his favorite American photographer of the last fifty years, remarkably high praise (read his review of the exhibition here). This handsome book covers Shore’s wide-ranging career, from black and white prints he took of Andy Warhol’s Factory while still a teenager, to his well-known images from road trips across the country from the 1970s, to large-format landscapes of recent years. He traveled widely, from Mexico to Scotland to Israel, and thrived wherever he went. Shore has the low-key brilliance of those who move lightly through the world, finding offhand beauty and humor wherever they are.